The Institute for Psychology & Wellbeing at the North-West University (NWU) will host its third Autism Symposium on 25 and 26 June. The symposium, which is presented jointly by the NWU and Autism South Africa (A;)SA), is an opportunity for all healthcare providers, educators, social workers, parents and individuals with Autism Spectrum Disorder to come together to connect, share and learn. It will take place in the Dawie du Plessis Lecture Hall on the NWU’s campus in Potchefstroom. Autism spectrum disorder (ASD) is a neurodevelopment disorder. People with ASD may communicate, interact, behave and learn in ways that are different from most other people. The learning, thinking and problem-solving abilities of people with ASD can range from gifted to severely impaired. Some people with ASD need high support (a lot of help and intensive intervention) while others need low support. People with ASD may also be significant contributors in fields of special interest to them as they tend to have unique, innovative perspectives. It is estimated that ASD affects one in 68 children and this number is increasing. Symptoms are evident from very early on in children. It is widely accepted that the best intervention outcome relies on accurate diagnosis as early as possible, followed by intensive family-centered intervention between the ages of three and seven years. There is evidence to show that the course of the development of a child with ASD can be significantly improved by optimising strengths and nurturing adaptability in social environments. Failure to diagnose the condition timeously, together with lack of intervention and poor parental support, is detrimental to good outcomes. The lack of services, timely diagnosis and effective intervention for clients in North-West Province was discussed at a meeting in 2015, involving the Institute of Psychology and Wellbeing, University of the Free State’s Dr DJ Griessel, the A;SA North-West development officer at the time, Dr Petro Erasmus of the NWU’s campus in Mafikeng, and Dr C Groenewald, a child psychiatrist. All agreed to offer time and expertise to establish a central resource service for educators, health professionals and parents. The Autism Symposium 2016 and the Autism Assessment Unit were the first collaborative initiatives of the Institute of Psychology and Wellbeing. The Autism Symposium 2016 was attended by 69 delegates, and presenters were mainly from the NWU’s campuses in Mafikeng and Potchefstroom. The effort was a success and received encouraging feedback from all involved. 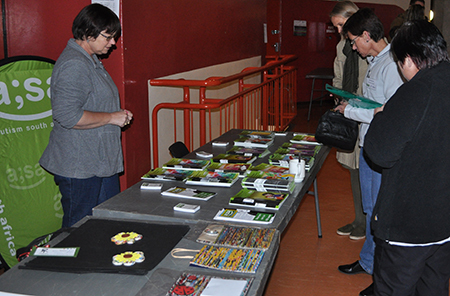 Participants at the first symposium indicated that an annual Autism Symposium could be key in creating awareness and contributing to the development of services in the North-West Province. The Institute for Psychology and Wellbeing and A;SA agreed to collaborate in organising a symposium for 2017. The outcome and feedback surpassed the initial 2016 collaboration. In all, 149 delegates and 10 exhibitors attended the 2017 symposium. The presenters were invited experts in their fields from the University of Pretoria, University of the Free State, North-West University and ASD-specific schools. Parents, who included the performer Thembeka Nguni and an adult on the ASD spectrum, also recounted their journeys to the audience. Another highlight of the event was the appearance by the lovable Autism dogs from the SA guide Dog Association. The feedback from delegates highlighted the value of including parent and adults with ASD as presenters in the programme. This year’s symposium promises to be an even bigger event than before. The programme includes remarkable parents and autistic adults sharing their unique journeys with ASD. The impressive roster of experts also includes Prof Petrus de Vries and colleagues from the Centre for Autism Research in Africa at the University of Cape Town and Dr David Griessel from the University of the Free State. Delegates can also look forward to hearing the story of Josh Crickmay, a young man with ASD who recently published a coffee table book on birds. Conference topics range from caregiver training and management of sleep difficulties to overcoming barriers to learning, work-related problems, girls on the spectrum, literacy development and intervention strategies. Interestingly, there will also be topics on boxing and drama groups for teenagers with ASD. For more information contact the NWU’s Institute of Psychology & Wellbeing on 018 299 1739 or email hanlie.degenaar@nwu.ac.za. During last year’s symposium delegates engaged with various stakeholders at the event.